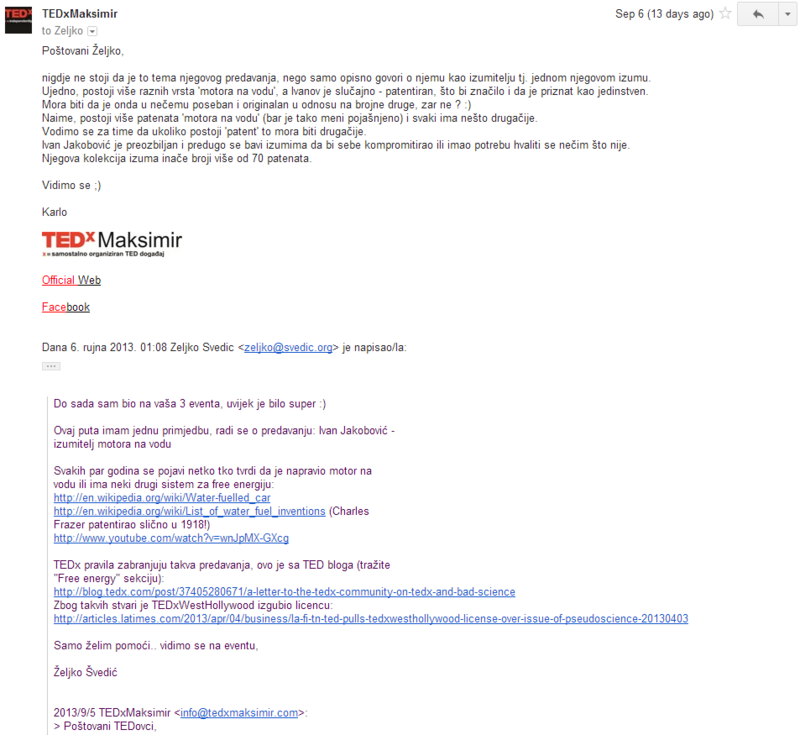 I got a lifetime ban from biggest TEDx in my Country. Why? Ivan Jakobović with his “water-powered car”. Because gas is so expensive, he modified his car to run on water. 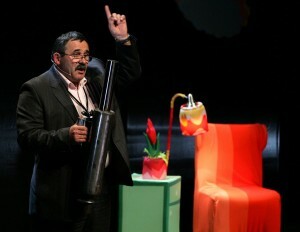 Ivan Jakobović and his “orgonic launcher”. It fires “orgon” into air and cleans the air above the city. 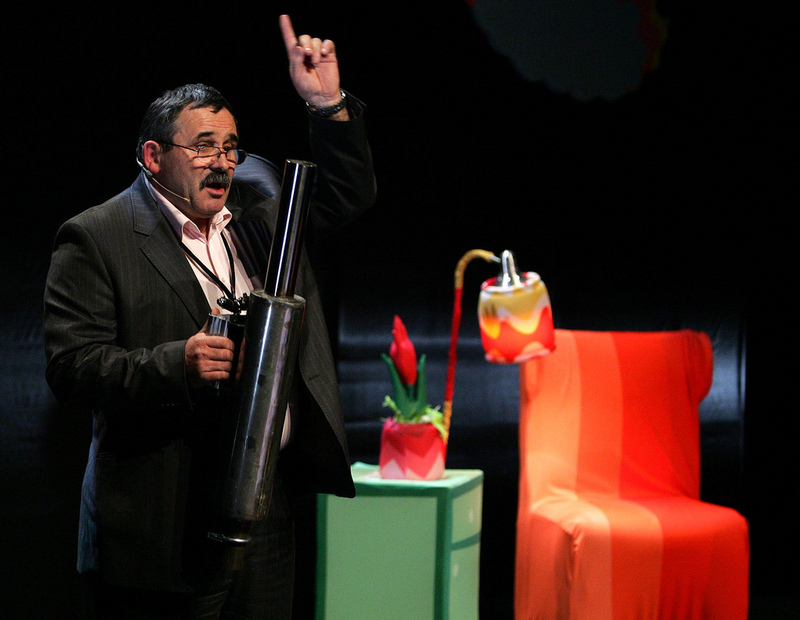 Ivan Jakobović demonstrating his “ozonic exhaust” on TEDxZagreb stage. Mounted on a normal car, “ozonic exhaust” converts 45% of CO2 to oxygen (ozone). You see, I don’t like TED. I absolutely adore TED. TEDx are independently organized but follow the same rules as big TED. No pseudoscience. Before I saw speaker list I was really happy to go. I purchased my ticket ($20) right from the invite e-mail. Only later when I checked speakers bios on the event page I noticed: “Ivan Jakobović – inventor of the water engine”. I got absolutely furious. Enough said. Why would I list arguments when Wikipedia and Mythbusters had done such a great job? TEDx rules explicitly forbid such themes, this is from TEDx blog (search for “Free energy” section). Because of pseudoscience TEDxWestHollywood lost its license. Black on white, Chris Anderson and his team were smart enough to anticipate this situation and provide detailed guidelines. Before going to sleep, I also sent above links to Karlo (event organizer), as I was not sure if he was reading FB comments. 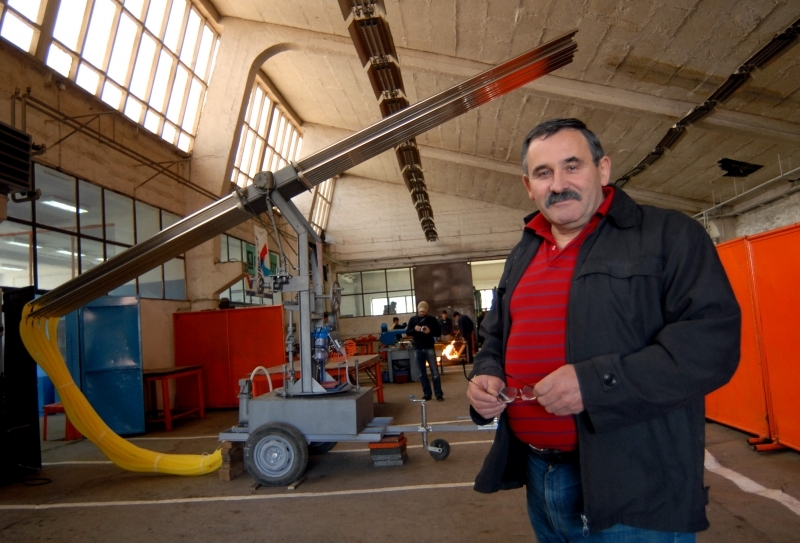 Ivan Jakobović will not talk about water engine, but about his inventions. There are many water engines but Ivan’s water engine is patented and that means something. He is a serious inventor with more than 70 patents, too serious to brag about something he didn’t do. Notice that second link I sent to Karlo listed bogus patents on water engines. But at least we were having a normal discussion over e-mail, so I decided to research the patents. So, I was wrong, Ivan Jakobović is an inventor. He has one patent in Croatia, for moonshine distiller. That explains some things. Notice that patent application is hand drawn. Before writing back to Karlo, I decided to check FB. It was mayhem. On two separate threads, people were either liking my post or calling me a Nazi. More than 50 replies, and one of them was directly from Ivan Jakobović! And then I got a call from Karlo. “How could you write that? You are ruining our event!”, he shouted. “I gave arguments why I think he is a scammer. Event is in two weeks, you can just remove him from speaker list.”, I replied. Ivan Jakobović achieved more in his life than you ever will. I was at his place and I saw water engine working with my own eyes! And because of publicly criticising him, I have no option that to remove YOU from the event! 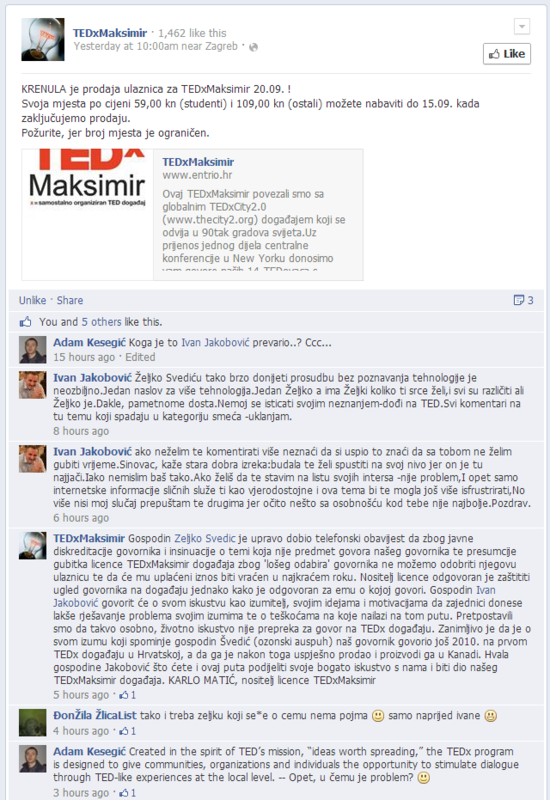 TEDxMaksimir team deleted negative comments from their FB page. They removed speaker bios from event page, and posted names of the talks instead (no mention of “water engine”). 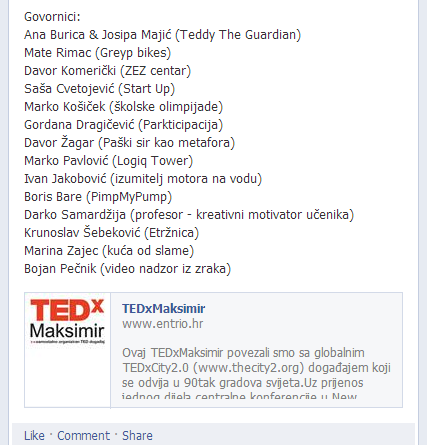 There it is, public support from TEDx for Ivan. Mentioning Canada success of ozonic exhaust is funny, because Ivan Jakobović with all his profitable international inventions was working as technician at high school for agriculture. Don’t worry, he is not teaching, because he never finished college. Don’t get me wrong, many great inventors didn’t have formal education. But I am surprised a man with such credentials wasn’t checked before speaking engagement. And exactly tomorrow, on Sep 20th 2013, Ivan Jakobović will deliver his second TEDx talk titled “Innovations. Motivations. Complications”. If you think that is kind of unfair, please share this. This entry was posted in Skepticism by svedic. Bookmark the permalink. It’s crap like this that’s made me turn from a TED addict who loved checking for new videos to somebody who, literally, didn’t walk across the street to attend a TEDx event. The speaker quality is nil. The brand means absolutely nothing. Please post a link to the event on Ted.org (http://www.ted.com/tedx/events/9889), and give an email of someone at TED, or even the contact form link. You need to give readers some way to complain to try and stop this. The issue was already reported to TEDx and actually in the meantime David Webber from TEDx commented below. Sometimes you need to let things play out. By trying too hard to force things, no matter how right you might be, you only end up acheiving the opposite effect. It is better just to let Jakobović have his podium for the designated time slot, and let the slow process of peer review take it’s course. Also, I am reminded of a quote by Galileo, “I have never met a man so ignorant that I could not learn something from him”. Phew! What a load of garbage. TEDx is really developing a reputation for being a mouthpiece for purveyors of every kind of credulous (and dishonest?) foolishness that TED was always meant to oppose. TEDx events should be disowned by TED and if possible the TED brand should no longer be used for satellite events. Get some local activism going to stop Jokobović and others like him taking others for a ride. Pun intended. Is there a local sceptical/free thinking organisation in or around Zagreb? FYI: not sure if you brought this to Tim Farley’s attention but it looks like it will get a good airing on Twitter. I to am unimportant but let me know if I can help. Based in South Australia and a member of the local SiTP. Elvin, thanks for advices! And yes, there is a local Skeptics in The Pub group (http://www.pzkm.org). We will see if SiTP events or posts like this will make any change in the future..
TED is great. TEDx is nothing more than a sharlatan parade and it should best be ignored, it’s not TED, in any way. At TEDx Brisbane (Australia) there was an Aboriginal gentleman who was speaking about his miraculous natural remedies that could cure anything including cancer. He was even selling them in the courtyard after the talk. It was a disgrace. So what happened after TEDxBrisbane? Did anybody report it? Orgon or orgone tech is just so way ouuuuttt there, beyond “left field…” talking of ‘intergalactic’ wayyy out there. If he talked about a better way to get moonshine (his patent from Croatia) and the alcohol from that were to power my gasoline-powered car that would be wow! But hell no would imbibe moonshine from a person who touts orgone tech. You go bro, and to the organizer that banned you, you had way too much moonshine dude or exposed yourself to way too much orgone in that guy’s “lab”. They lost me when they put Sarkeesian on stage. That do not curate or vet speakers. It say on the sticker that is on the car that it’s a hybrid car? Wouldn’t that imply that it’s not entirely powered by water. Learn to read dude. Believe it or not, the fact there is still a petrol tank somewhere makes a perfect sense to me..
dude, ted is not that great. We always giggle at the applause section. listen to it. People get really excited. a bit sect like of you ask me. They need good talks even if it is about mythical energy… to keep the good spirits advice you know. For your information I saw that engine run with my own eyes. I even had a privilege to be there while the engine was turn to parts and back together. engine works. Not on pure water of course but on mix where only 20% is fuel if I am not mistaking data. So don’t be jealous id you didn’t build it. You will have you chance with something different. Are there really that many people out there who lack even a cursory knowledge of physics and chemistry? Did you consider also the fact that if it has actual fuel put in it… it’s probably running on that? We are sorry to hear that you were disinvited to this event and are looking into the issue. With less than 24 hours to this event it is very hard to assess and make a judgment on this technology and speaker. While TED offers specific guidelines for organizing TEDx events, TEDx organizers independently curate both their speakers and attendees. We will consider this incident when we look at renewing this license. Electrolysis is a well known process for splitting water molecules with electricity (AC or more common DC) what you get is 2 molecule of Helium (Rocket Fuel which is used to power NASA’s chemical rockets into space) and 1 molecule of oxygen. There is a guy with Croatian roots who lived in US by a name Andrija Puharić, Ph.D, he drove a hand made custom built water-fueled car all over the U.S. There’s also one Bolivian guy inventor, Francisco Pacheco. He created a device that turns sea water into clean, combustible hydrogen on demand. There’s also a lot more of people like this who achieved extraordinary results, but were either; ignored by the big-oil billionaire companies, bullied into silence, bribed, or their patents were bought and simply NEVER used. Most died penniless. Check the example of N.T. Also, check out other interesting names now that you’re at it,like; John SEARL generator, Victor Schauberger, John Ernst Keely, R.R. Rife and etc. I bet there are thousands of them, but “we” don’t know. Why? The answer is human Greed. Electrolysis is well known. We understand that to break those molecules apart requires energy, the same amount of energy that you get when it burns, minus efficiency losses. Using any kind of existing power source to split the water to burn it again will always net you less useful energy than you started with. The only way this can be useful if it is simply used as a storage battery, using solar power perhaps, to charge a battery with this technique. But it’s not going to get you very far in a car. In addition to svedic’s corrections of your slip-ups (everyone makes those every now and then), I would like to point out that if you are using electrolysis what you have is not a water powered car. What you have is an electrically powered car using hydrogen as an energy storage medium. Hey! Found the link to here on NeuroLogica blog. Great job man! Initially I thought that it must have been some kind of misunderstanding, but after reading the original email from Karlo I can only say: what a massive arrogant dumbass he is. Well it’s only going to blow up in his face later – although some people are capable of amazing feats of denial even when presented with clear evidence so I don’t count on it. What’s sad is that, before it becomes obvious that there’s no working “water engine” (and it can take a while, like with Andrea Rossi’s “Energy Catalyzer” from the neighbouring country), the focus will be on the next silly thing and few people will realise that they’ve been tricked and will be open to fall for the next magic trick. The only thing I wanted to comment on, besides thanking you for your skeptical activism and wishing you good luck, is that “scammed” might be a strong word: I don’t know if Ivan is intentionally scamming people (is he trying to sell it in any way?) or he’s “just” deluded? For example, it’s fair to say, looking at his previous (criminal) fraud history, the way he is attempting to monetize his “invention” and the way he’s avoiding any real tests, that Andrea Rossi is a con artist. Is that really the case with Ivan Jakobović? Filip, thanks for feedback, interesting points! Regarding scamming, my opinion is that one is a scammer no matter if they are currently making money or not. Some people make free energy claims just to get famous, that doesn’t change the fast they are publicly and intentionally deceiving other people. So it is probably not only for the glory..
You did the right thing. The world needs more people like you. I’m wondering if they still have the support of TEDx. There have been no events posted since May 2011 and Ivan isn’t listed on the one event that is fully filled in. Pingback: We “orgone” to die. No matter what the quacks say. Do you think the problem could be that the organizers mean well but are simply too scientifically illiterate themselves to be able to distinguish pseudo-science from something which at least has a chance of making sense? Yes, I think that is exactly the problem. When Karlo phoned me, I said to him: “This guy fooled you and your content team.” Separate problem is that they don’t want to hear that. Pisati nešto što nije utemeljeno, tvrditi nešto što nije vidio, “blatiti” nekoga koga ne poznaje je doista strašno.Vezati se na necenzurirane i neautorizirane novinske članke dovoljno govori o podlozi i namjerama Švedića.Isticati svoje neznanje kao Švedić je doista sramotno.Ne želim se s njime na bilo koji način susretati osim nadam se uskoro na zato određenom mjestu.Predao sam odvjetniku sve njegove “tvrdnje”.Budala uvijek želi “pritivnika” spustiti na svoju razinu i pobijediti ga jer on je tu najjaći.E, Švediću mlad si za mene i ovo će ti biti jedna životna škola.O tvojem radu neželim komentirati iako sam te naravno “pregledao”.Osobnost i komplekse moraš staviti pod kontrolu-moj savjet. And quick tip for you Ivan, putting a space after a period will greatly improve your credibility. I’ll need a Google translation of the Google translation. Personally, I think TED(x) should loosen up a little bit when it comes to whom they allow to speak. We need to hear from people who push the boundaries and open up possibilities, who are in a sense more philosophical or hypothetical, in order to enthuse us to take nothing for granted. A famous example is Eric Laithwaite’s gyroscopes lecture to the Royal Institution. 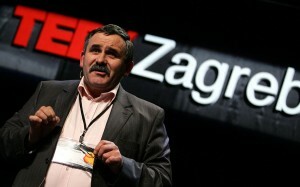 http://www.rense.com/general42/genius.htm TED(x) could categorise such talks so that we can identify them in the programme. At the same time, I agree that no-one wants a speaker to be allowed to trot out delusions, falsehoods and ideas that have already been clearly refuted, in other words to wilfully mislead an audience. I want the truth, not something that will make me click the next video, not something that will make me grab my pop corn. I am not someone who want to be entertained with a lie, I want to be entertained with the truth. Thank you for your efforts and exposing the truth. Its not only their fault , this is how humans work, they don’t want to listen to the truth. Truth bores them. And it bores because they don’t really understand it. I am always skeptical with anything I see online, on TV, or hear from a friend. And in the corner of my mind I always know that the possibility of a lie is always there. Its sad , but thats how the world works and thats how it fails. actually, i think thats what TEDx is about. let him talk and if his stuff is bunk, it will soon be noticed/reviewed and he will have no cred. i would hate to see the rules tightened so much that someone with real invention gets axed cause of restrictions being too tight. that said, yes there should be some checks, and i dont know enough about Ivan to comment about him or his machine. i am just saying dont over-do it. Wow i cant believe ppl still dont know its a scam! Some guy in my country (pakistan) also ‘invented’ a water fueled car a few years ago, it was on the news and all until a proffessor from a university discredited him and made him confess that he was using carbide to split up the water into hydrogen for burning, but the cost of carbide is more than petrol and even though your car would run on water for a while, once the carbide is used up you’ll have to buy more which will end up costing more than if you ran it on petrol. First let me point out that i completely support Mr. Svedic! Why? Because he is correct! Water for fuel is a major movement that lasts for over half a century now. There are so many ideas and even patents behind this that it is impossible to track them all for last 50+ years. However, not single one of those worked successfully! Even though it may produce some benefits in saving gas expenses it also may degrade IC engines via corrosion and it produces poisonos (i.e chlorine) gases depending on electrolyte type ang gas feed system. I am certain that Mr. Jakobovic simply hooked up just a simple electrolytic HHO generator cell in his car,without any serious scientific approach and research, same cells that anyone can replicate just by watching numerous Youtube videos! Thus making himself just a copycat! Regarding his other inventions…Orgon launcher! Orgone?? Hypothetical universal life force! Well, i will rest on this one but i have to point out that speaking of orgone is pseudoscience! Even if Vilhelm Reich (who propsed this idea in 1930’s) was still alive i would skip even considering it. Oh, BTW, regarding Mr. Jakobovic Orgon (orgone) launcher, please check Wikipedia and check for “Orgone”, in the “Hystory” section. There, you will se a photograph where you can see Mr.Vilhelm Reich with his “cloud buster” during 1930’s. See any resemblance with Mr. Jakobovic Orgon Launcher? 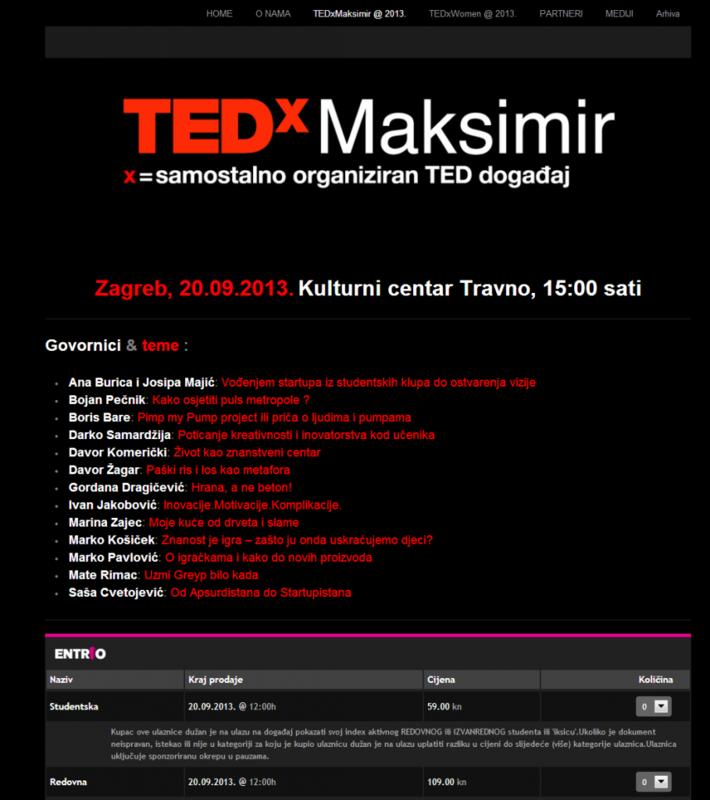 So, i think that it is a disgrace for TEDx for inviting uneducated charlatans and fraudsters and not only that but for revoking Mr. Svedic licence just for warning them of Mr. Jakobovic nature! So Švedić, how did it all end? Did you hear from his lawyer or it was just a bluff (my guess)? You guess correctly 🙂 But I would love if he had taken this to the court, that would be another round of fun.